In 1933, Franklin Delano Roosevelt issued Presidential Executive Order 6102 which demanded that those who were “hoarding” gold coins turn them over to a Federal Reserve Bank or branch as this hoarding was hurting the economic recovery. It was a claim that was false but effective. Hoarding in this case meant simply possessing gold coins by holding on to them and the government used the 1917 Trading with the Enemy Act as justification for this theft. The gold coins were to be taken to a Federal Reserve Bank and traded for paper currency. While Roosevelt used the excuse of the country being in a national state of emergency, the confiscation actually encouraged (by force) the use of banks as a place to store money—something many Americans were very skeptical of doing at the time. So, the goal of confiscation was two-fold: bail out the Federal Reserve and force people to use paper currency which they distrusted. The penalties for disobeying the executive order were harsh: a $10,000 fine and/or imprisonment not to exceed 10 years. There’s disagreement over whether or not this penalty was enforced but you did see most people complying. People were left with no choice but to convert their gold into paper currency that they then had to store in banks as paper was far less durable than precious metals. 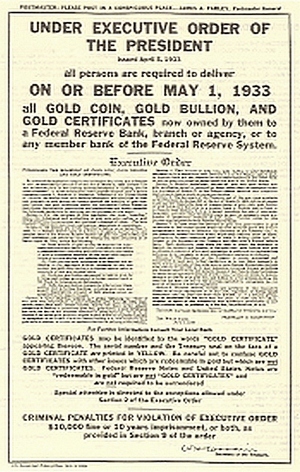 Harry S. Truman continued this prohibition on gold as a currency when he issued Proclamation No. 2725 which forbade banks from paying debts in gold. Roosevelt’s confiscation was one of the first instances of what is now known as civil asset forfeiture. For forty years afterwards, it was illegal to pay debts in gold, with that prohibition ending under the Nixon administration. So we see a precedent set for confiscation and this has led to various conspiracy theories about the same thing happening under the current administration. While government overreach is a serious problem, we take a practical approach when it comes to educating our clients. Can Gold Confiscation Happen Again? The simple answer is yes and no. If you read other precious metals blogs you may find them suggesting that you buy specific coins that they claim cannot be confiscated by the Federal Government. These coins often have numismatic value and are often sold at prices significantly higher than their gold content. The reasons for buying numismatic coins are tenuous at best and we’ve dissected the myths before. The bottom line is that if the government decides to confiscate property, no special coin will stop them from doing it. The sheer power of the state can’t be stopped by magic words or coins, unfortunately, and if a gold dealer is telling you otherwise they don’t have an understanding of history or power (or may be trying to unload coins that are steadily decreasing in value). But, how likely is it that the government will forcibly take your gold coins and would it even be practical? The truth is that it is highly unlikely they would because 1. There’s no good reason to and 2. It would be quite difficult to find all the gold people possess even with the means the government has. The reasons given that gold will be confiscated by the government don’t hold up to scrutiny, but we’ll cover the most commonly used one: the dollar collapses and they need your gold for economic stability. In the event of a dollar collapse there will be much more to worry about than whether the government is coming to get your gold and since there’s so little of it, it would be pointless to take it for any form of debt payment. The amount of gold individuals possess in the U.S. is actually very small and much of it is held in larger depositories. Let’s crunch some numbers. The U.S. is currently 18.2 trillion dollars in debt; the latest data from the Treasury shows that they alone hold 261,498,926.230 fine troy ounces which at the time it was recorded was worth around 11 billion dollars. The population of the U.S. is 319 million and even if we assume that 10% of the population (a generous estimate) is informed about investing in gold, we’re still several trillion dollars short of any meaningful impact on the debt. Then there’s the difficulty of finding who owns the gold the government would want to confiscate. You can buy gold with cash at most places including here and most of the time there’s no record kept of this transaction. It would take a massive effort of the military going door to door diligently searching for this gold during a time where there would be massive civil unrest. Do you really think they would go through this effort to collect something that wouldn’t even come close to fixing the problem of a dollar collapse? The problem of the national debt is a real one but saying the government will confiscate gold to fix it is fantastical. When you look at the numbers and think rationally about the motivations for gold confiscation, the fear melts away. Don’t fall for fear mongering gimmicks to sell you over-valued gold. While it has happened in the past, given current circumstances it is highly unlikely gold confiscation will happen and just doesn’t even make sense to do considering the arguments given. You’re in more danger of getting caught up in a suspicious activity report than government goons breaking down your door looking for gold. Gold is a solid investment for many reasons and there’s no need to make up fantasy-based scenarios in deceitful attempts to sell more.